Set in the tenth year of the First Cylon War (roughly forty years before the events of Ron Moore’s reimagined series and nearly twenty years after those depicted in its sequel Caprica), Blood & Chrome tells the story of the first combat mission of young William Adama as a freshly-minted Ensign aboard the Battlestar Galactica. Though trained primarily as a Viper pilot, Galactica’s commander sends young Adama on an apparent “milk run” in a Raptor instead. Once en route however, Adama and his frazzled copilot learn from their mysterious female passenger that their real mission is to rendezvous with Colonial forces deep in enemy space. After narrowly escaping a patrol of Cylon Raiders, they’re directed to deliver their passenger – an attractive computer scientist who was involved in the creation of the Cylons – to a frozen and abandoned planet as part of a risky special forces raid with an unknown objective. The only thing Adama can be certain of is that their odds of surviving are long indeed. 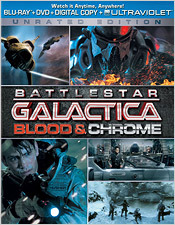 Battlestar Galactica: Blood & Chrome was originally produced as a 10-episode web series (first airing via streaming on Machinima.com) and it’s now available from Universal Studios Home Entertainment in an uncut and unrated 94-minute movie version on Blu-ray and DVD. As written by Galactica veterans Michael Taylor, David Eick, Bradley Thompson and David Weddle, Blood & Chrome delivers an exciting war adventure story that fits well within the reimagined Galactica timeline, replete with exciting space and ground combat action, pumped-up military bravado and plenty of eye-candy visuals. The performances are all solid, including newcomer Luke Pasqualino as young Adama and Ben Cotton as his ECO, copilot and eventual friend, Coker Fasjovik. Lili Bordán is also interesting and engaging as Dr. Beka Kelly. It’s just too bad this is all we’ll see of her, especially given the fact that there really aren’t any other major female characters that last in this show. (To be fair, there do appear to be a couple in the deleted scenes, but they only briefly appear in the unrated cut of this film.) The series also breaks new ground in genre TV storytelling by using almost no practical sets and locations – the entire thing was shot with actors working against green screens, with virtually every story environment created by digital effects. The result is an undeniably impressive technical achievement that’s gorgeous to look at. Unfortunately, it’s that same technical achievement that ultimately works against the story. One of the most basic rules of good storytelling is that you need to firmly engage your audience and then keep them engaged, avoiding anything likely to distract from story and character and thus break the illusion. Blood & Chrome fails this rule on two counts. First, it’s clear that the visual effects team was given free license to make each shot as cool and interesting as possible, adding all of those unrestrained little extra touches that typical TV VFX budgets don’t usually allow. As a result, every single frame of Blood & Chrome sparkles with bustling background action, glossy atmospherics and glittering detail – things that look absolutely terrific but consistently overwhelm the eye and distract from the story. Someone in a position of leadership on this project really needed to visit the effects department and say, “Hey guys… that looks awesome, but we really need you to dial it back about thirty percent.” It’s a problem all too common these days in Hollywood filmmaking, but one that rarely plagued the Ron Moore Galactica. You can just go too far with VFX and show way too much. It’s the reason the original Star Wars films are better than the prequels, it’s the reason the original Alien is far superior to Prometheus. Great directors, cinematographers and especially editors know that less is almost always more. Blood & Chrome also manages to break its own illusion in a second way, which is the excessive reuse of actors. At least four times during this film, actors previously seen in either Battlestar Galactica or Caprica or both appeared again here playing completely unrelated characters. (Specifically, Brian Markinson, Ty Olsson, Jill Teed and Sebastian Spence.) So as an excited BSG fan, you’re engaged in the story one moment and then you’re suddenly thinking, “Hey, what’s Captain Kelly doing here?” or “Whoa… is that Narcho?” After you spend a few moments puzzling over that, you suddenly realize you’ve missed critical dialogue or story points and you have to go back. It’s just unnecessary. It’s understandable that as a producer there are times you work with actors that you really like as people and just want to use as often as you can in other projects, but here it really undermines the viewing experience, especially if you’re intimately familiar with those other projects. In terms of A/V quality, Universal’s Blu-ray release mostly delivers the goods. It compares very well in some ways with the studio’s previous Battlestar Blu-ray titles. Contrast is excellent with deep blacks. Colors are rich and vibrant, though often muted or highly-stylized depending on the environment. It’s worth noting however that Blood & Chrome has a more glossy cinematic style akin to J.J. Abrams’ Star Trek reboot, complete with abundant reflections and lens flares. The 5.1 DTS-HD MA sound mix is sufficiently dynamic and immersive, with great bass, active use of the surrounds and a typically excellent and drum-thunderous Bear McCreary score. Extras on the disc are slim, but you do get about 30 minutes worth of deleted scenes in full HD (though mostly unfinished) and a 23-minute featurette that – surprise – mostly features the visual effects team showing off all their cool work and talking about how groundbreaking it is. As per Universal’s norm, you also get DVD, Digital Copy and UltraViolet versions. Its problems aside, Blood & Chrome nonetheless remains a solidly entertaining experience. While it looks a lot more like a Battlestar Galactica videogame than either of the series that preceded it, it’s certainly far more interesting and enjoyable than anything Caprica had to offer. Still, one does hope that if Blood & Chrome ever goes to series, either on Syfy or online, the producers will ask the VFX team ride shotgun instead of letting them drive the Raptor. With a slightly lighter hand on the throttle, this could become something really special.